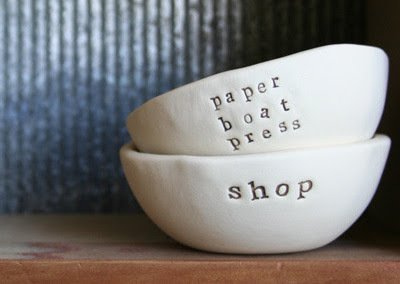 If you have been dying to get some of Kylie Johnson's gorgeous ceramics and poetry but haven't seen them in-store, now you can order from anywhere in the world at the new Paper Boat Press online store. Kylie is stocking her ceramic quote tags, poetry books, limited edition letterpress prints, quote pencils and bird wall pieces in the shop. Keep an eye out for new items (including poetry vessels) via the Instinct and Grace blog. And as a special offer during the first few weeks of the store being online, Kylie is offering a 10% discount on all orders placed by June 10th 2009. Use the code: PBP in the box provided on the checkout page and your discount will be calculated once you press enter. Shipping is available worldwide. Check out this post for details on Paper Boat Press Christmas decorations. Hi Cath and Chrisy! So beautiful in real life too. They really feel like special pieces.